The Social Business Forge Project is initiated by ICT4D.at with the aim to collect and disseminate knowledge about ICT4D, social enterprises and the implications for setting up an association in Austria to support these developments. 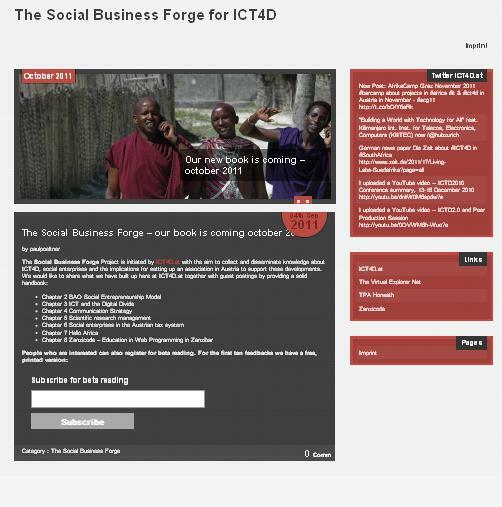 We would like to share what we have built up here at ICT4D.at together with guest postings by providing a solid handbook [from the Social Business Forge page]. The whole thing is a book which we will realease online and which you can also order as printed version. We want to release it in October. Additionally to many general chapters on running an organization like ours, Chapters on our projects Hello Africa and Zanzicode are included. As it should be an ingoing project with updated and new chapters periodically, you can now even apply to beta-read the book and have your comments included in a coming version. So check the Social Business Forge website and we’ll notify you again when the book will be finally released.